Few composers have the self-control seen here to allow the silence that surrounds all we do to be so present, to bring to the forefront that which is covered by all of our daily activities, only present when we let ourselves realize the stillness at the base of all action, all sound. The regular presence of notes in calme étendue (oboe) provides for the listener a feeling similar to that of a light on top of a lighthouse as it regularly turns in the night – a feeling of grounding. Every eight seconds, the oboist reaffirms the world of constructed sound with constant repetitions of three seconds of a sound followed by five seconds of silence. After a group of these beacons, the silence takes over again. The feeling is of heading back out to sea as silence resumes its supremacy. The subtle play of sounds given to the oboist comes from an aspect of playing so common many professional players do it almost unthinkingly. Most oboists, when playing notes that use only a few fingers will add keys lower down on the oboe to provide subtle alterations of pitch and tone quality. The ethereal beauty of the subtle color and pitch changes make the sounds heard in calme étendue (oboe) haunting, yet beautiful. The interludes of John Cage’s Music for One are also haunting, again using alternative pitches and tone colors. 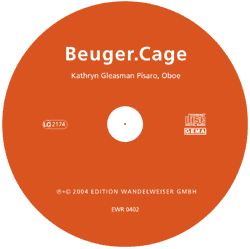 Cage uses microtonal inflections, mutes and harmonic fingerings to subtly shade the tones and pitches, surrounding each grouping with expanses of silence. Although long notes and short phrases dot the composition, the most memorable features of the work are the melodic vignettes that appear throughout, examples of Cage’s melodic gift. Possibly a legacy of his early love of Grieg, these melodies create small worlds that become clear when heard in a solo version, as they are here. 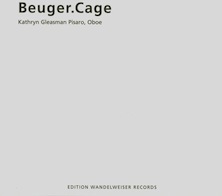 The Eastern nuances of the oboe sliding between notes, the elephantine qualities of loud, low playing, the manic energy of the last explosive phrases, the plaintive quality that comes through when a section is played at a slower tempo, all of these musical nuances come from a part of Cage not usually revealed.